“We’re delighted that the cruelty of greyhound racing will not be propped up by these machines,” the organization’s president, Christine Dorchak, said. A Travis County judge ruled Monday that the Texas Racing Commission overstepped its authority when it approved historical racing machines in horse and greyhound tracks across the state. The August decision by the commission allowing the instant gambling machines generated opposition and a lawsuit from a coalition of more than 25 charitable organizations benefiting from bingo. The groups feared the machines would cut into their business. Judge Lora Livingston ruled in favor of the bingo coalition Monday, finding that an approval of historical gambling should go through the legislature. 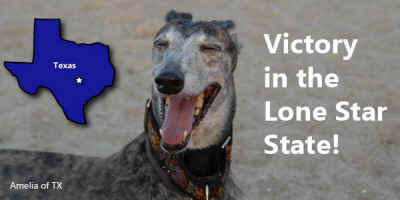 Greyhound animal rights group GREY2K USA, also commended the judge’s decision. In a 7-1 vote Aug. 29, the Texas Racing Commission approved the use of historical racing machines, a type of gambling device that lets players bet on past races, at the state’s horse and dog tracks. Historical racing machines have already been installed at race tracks in states including Kentucky and Arkansas. On Monday a judge ruled the racing commission overstepped its authority. Sally Briggs, spokeswoman for Gulf Greyhound Park in La Marque, said that the track will decide whether it will pursue legal action. The ruling may affect Texas’ three greyhound racing parks, four horse tracks and simulcast locations, which were considering installing the machines.